(1) Guest Editorial - 40% of Urologists Report Burnout - A new study shared the harsh news that life as a physician isn't as rosy as patients often expect. In fact, urologists report a high rate of burnout and dissatisfaction. 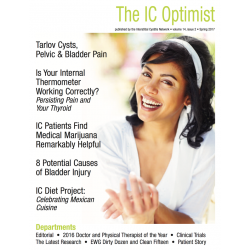 Urologists are often the lifeline for IC patients and their health and well being is an issue that we, their patients, should also pay attention to. 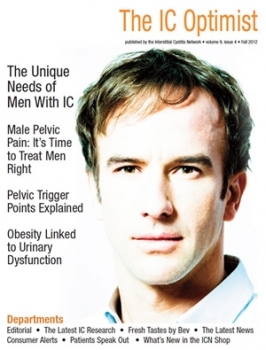 (2) The Unique Needs of Men With IC - With the release of a new study demonstrating that up to four million men in the USA may have symptoms of IC, we can no longer say that IC is a "woman's disease." In this feature story, we give men our full attention. 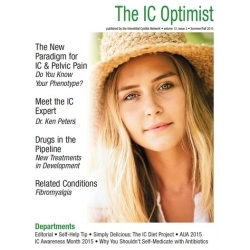 This article covers the "unique" struggles and needs that men face in obtaining a diagnosis, finding effective treatments and the all important self-help strategies. (3) State of the Art Treatment - Male Pelvic Pain: Its Time to Treat Men Right - Pelvic pain often originates in the pelvic floor muscles. 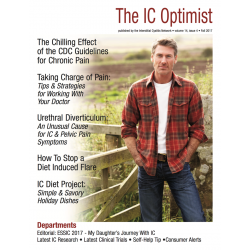 Stephanie Prendergast and Elizabeth Rummer (San Francisco), two of the best physical therapists in the USA, share their experience treating men successfully with pelvic floor therapy. (4) Obesity Linked To Urinary Dysfunction - A new study was released this Fall demonstrating a clear connection between obesity and urinary and sexual dysfunction. Weight loss, often a touchy subject, may be one of the most important things that you can do to help your bladder recover. (5) Pelvic Trigger Points Explained - Almost everyone has experienced having a hard painful muscle knot somewhere in their body. What usually makes it feel better? Having someone press on it. Yet, muscle knots in the pelvis aren't quite so easy to treat. Elizabeth Rummer MSPT offers the latest strategies. 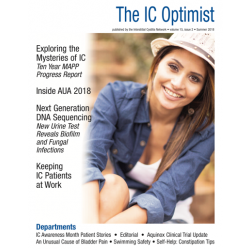 (6) Patients Speak Out: IC Awareness Month Patient Stories - The September awareness campaign was a fabulous success this year thanks to our readers and members. We're happy to share just a few of their stories here! (7) Consumer Alerts If you've been interested in trying Green Bean Coffee Extract for weight loss, you may want to hold off. More patients are reporting severe flares due to the much higher than normal levels of acid in the extract. Unsure if compounding pharmacies are safe? Many patients rely, very successful, on medications prepared at their local pharmacies. Who would have thought that licorice, a popular candy, could cause severe, life threatening reactions. (8) Soups To Chase Away Holiday Chills and Ills With cold weather quickly approaching, what could warm our spirits more than some fabulous IC friendly soups. IC writer Bev Laumann shares three fabulous recipes to help chase holidays chills away. We've also included several favorite soup recipes submitted by patients to our website. (9) Need Some Comfort - From sitting comfortably to treating pain, we share our favorite OTC items to ease your symptoms and discomfort. Includes: When you can't sit comfortably, when you can't relax or sleep, when you must eat some acidic foods, when pain is dominating your nights, when you hurt "down there," when you're desperate to exercise, when you need something hot to drink, when you need some chocolate, when you need to calm the stomach or gut and when you need some simple, yummy foods.